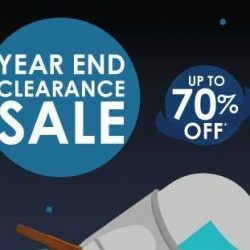 Get ready for some out-of-this-world deals at Scanteak's Clearance Sale at Henderson! From 10 - 12 Nov 2017, save up to 70% on teak furniture items, and grab those exclusive items priced to clear before they're gone! With $2 top-up deals and other gifts with purchase, there's no better time to get your house ready for those year-end parties! 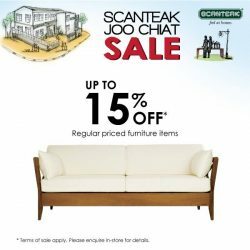 Till 19 Feb 2017 Scanteak: New Wisma Atria Store with Up to 60% OFF Teak Furniture + 13% OFF Anything That Opens! Scanteak is popping up in the heart of town! 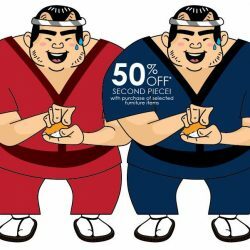 Come visit them at Wisma Atria for exclusive opening deals with up to 60% off teak furniture, $2 specials and sure-win lucky dip! 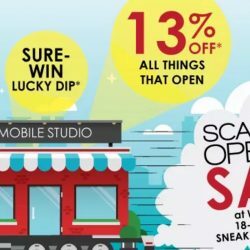 Anything* that opens (with drawers and/or doors) are entitled to 13% off to celebrate the 13th store opening! Take your pick from their Chest of Drawers, Wardrobes, Bedside Tables and more! Mix & match selected items and enjoy this incredible deal! It's an AWESOME 50% OFF 2nd piece! 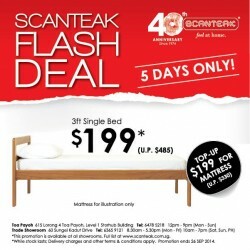 We don't know what else to say except that you should be heading down to our Isetan Scotts showroom to enjoy this crazy deal! Hurry as this promotion is ending this Sunday (28 Aug)! *Terms of sale apply. Gifts differ based on purchase amount. Nothing beats being in the comforts of the people you love! Feel at home with us and pick out your perfect Scandinavian furniture to warm your home. 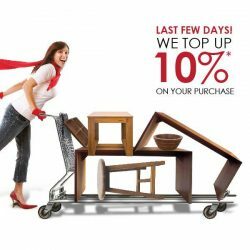 Regular priced furniture enjoy discounts of up to 15% off this FINAL weekend! 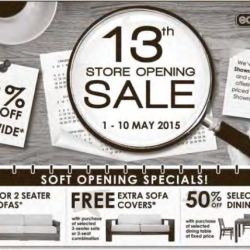 So wait no further and come visit our Joo Chiat showroom, with many other exclusive deals prepared just for you! 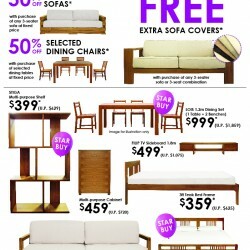 Check out the Scanteak Super Summer Promotion. For a limited time only, hurry! 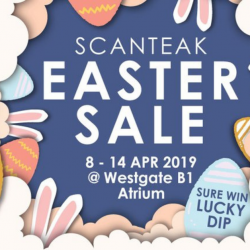 They’ve opened their 13th Showroom at Suntec City, and are celebrating by offering 13% off regular priced items at Scanteak Showroom island-wide! Scanteak offers Signature Opening Welcome Gift for 1 week only. Free Throw Cushion Set (worth $87) until 30 April 2015. 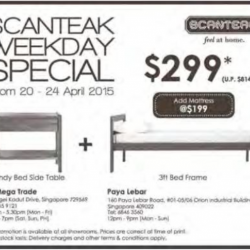 Get your family and friends this Scanteak Weekday Special from 20-24 April 2015. 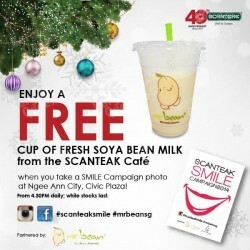 They're packing up tomorrow night, but it's still not to late to get that free cup of Fresh Soya Bean Milk by your friends when you take a smile campaign photo, Mr Bean Singapore at the Scanteak Cafe! 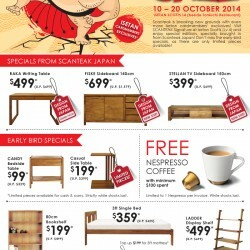 Scanteak is breaking new grounds with even more Isetan cardmembers' exclusives! Visit SCANTEAK Signature at Isetan Scotts (Lv 4) and enjoy special editions, specially brought in from Scanteak Japan! Don't miss the early-bird specials, as there are only limited pieces available! 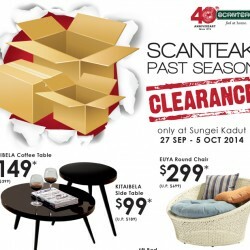 The Scanteak Past Seasson Clearance at Sungei Kadut outlet is now on. Valid till 5 Oct. 2014 or While stocks last. 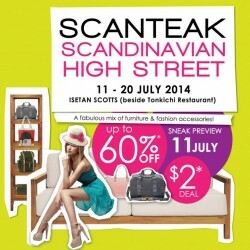 Scanteak collaborates with some of your favourite fashion barands to bring you a Scandinavian High Street sale at Isetan Scotts! Enjoy up to 60% off furnitures and fashion accessories. Valid from now till 20 Jul. 2014. 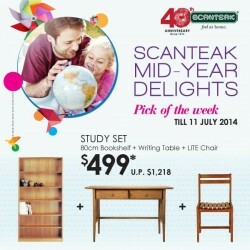 Join Scanteak's Mid-year delights special buy till 11 July 2014! Enjoy study set at $499! Which includes a 80cm Bookshelf, a writing table and a LITE chair.